If you’re of a certain age, you’ll remember the Fighting Fantasy book series. Released at the height of the Dungeons and Dragons craze, these books were effectively solo role-playing games – a novel in which you took decisions on a fantasy quest. You’d either be successful, or die horribly on the way, and the games could often be quite a challenge. The use of dice to determine your character’s stamina, skill and luck, and a combat system that made battles unpredictable, introduced a random element to gameplay, and you’d often have to make several attempts to solve/win each title. I first came across these books when I was nine years old – my schoolteacher at the time got hold of some and I played “Forest of Doom”. I subsequently played a number of others in the series over the years, although I wasn’t quite as addicted as some of my friends. The series came to an end in 1995, and I guess it dropped off the cultural radar. Role playing games have remained popular, of course, but the Fighting Fantasy books faded away into obscurity. However, recently I came across this article about a relaunch of the series with a new title by Charlie Higson. His “Enemy” books – a post-apocalyptic zombie horror series for young adults – was absolutely fantastic, so I felt sure he was a wise choice to write a new title. It proved so popular that when I went to the large branch of Waterstones near my office on publication day, all copies had gone by lunchtime. Slightly disappointed, I ordered a copy online, and it was in my hands a couple of days later. 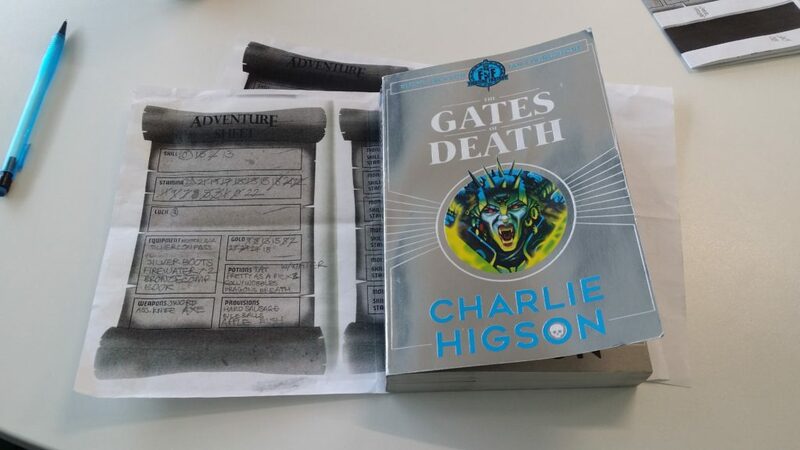 Gates of Death with completed Adventure Sheet from my successful attempt! I had to admit that initially I felt a little disappointed, as the presentation and quality didn’t seem as good as the FF books of yore. The cover design, especially on the back, seemed a bit poorly executed. The typeface and illustrations I remembered had all changed too. Was this going to be something that would never live up to the magic of my youth? Thankfully, my doubts disappeared as soon as I started playing it. Given that it was many years since I last played a Fighting Fantasy book, and that I regularly cheated anyway, I had to catch up on the rules first. They’re quite simple, although I did find a couple of things a bit less than clear and perhaps open to interpretation. But…if you interpret them consistently throughout, it’s not going to matter too much, and you’re not affecting anyone else’s experience. The plot of the book is that a terrible plague has struck the land, turning people into vicious demons. You have an antidote, but only enough for a few people, and your quest involves getting some to a temple where more can be made, and then fighting Ulraakah, the queen of demons. The game is effectively split into three phases – the first part in Port Blacksand, the second on the journey to the temple, and then finally the endgame, which involves some fairly epic battles. At any point, a battle or a wrong decision can kill you, even very close to the end. Each part of the game has several different routes through it, and depending on how you progress, this will affect how easy or difficult you find the endgame. There are quite a few possible ways to win, and just as many ways to lose. I solved and completed the adventure on my sixth attempt. Previous ones resulted in quite early deaths, but my fourth attempt came very close. You’d probably manage it sooner if you cheated by not restarting every time you made a dumb decision or winning every battle, but I was determined to do it properly! When I was a kid I never had the patience or the attention span for playing one of these properly, and it’s a shame, because when it’s done the way it’s intended, these games are a brilliantly escapist way to spend a few hours in a fantastic world. I really enjoyed it. Higson has had his finger in many pies – you may remember him as Colin Hunt the office joker, or the painter with a strange fixation with the colour black, in The Fast Show. He’s written a lot of books for children and young adults, and has written for a lot of TV shows, and as a result, the book is awash with pop culture references that anyone of a certain age will smile at. There’s a Prince lyric in there, a mapmaker who will remind you of a scene from “Hot Fuzz”, and I wonder whether the demon queen’s name is a reference to Reeves and Mortimer’s “Shooting Stars”? – Ul-riiiiii-ka-ka-ka! If you’ve played these games before, I’m absolutely sure you’ll enjoy having a go at this, and if you haven’t, you’ll possibly find yourself getting sucked in pretty quickly. I’m keen to have a go at some of the classic ones now, so I’ll pick some up if I come across them. It also reminds me of that old staple of my youth, the 8-bit text adventure. Again, I was hopeless at solving them when I was a kid, but there were loads of them available for my computer of choice – the Spectrum – back in the day. I have a working Spectrum here beside me, and just about every game published for it is now downloadable, so I think I’ve spotted another way of whiling away the evenings and weekends in the near future.